The main street of Luang Namtha is abruptly vacant and calm. The emptiness is occasionally broken by an odd motorbike. Most of the locals don’t even bother to look up at the momentary traffic passing through. A few rusted awnings are squeaking in the breeze and a neon sign flickers to life in the dying light. It could be a scene from a western, but we are in the north of Laos not far from the China and Burma borders. Conveniently across the road is the Thoulasith hotel which is just as well as its obvious we are going no further tonight. A large room downstairs comes with that all-important luxury in the tropics, air-conditioning for a princely sum of just 110,000 Kip. We have gone from dividing by 6 to 8000 for $1 USD. Having changed our money at the Laos border I have since become an instant millionaire. That night we lie in bed plotting new adventures with remote hill tribes in Phongsali, sleeping in jungle tree houses and zip lining with gibbons in Huay Xai. But while calculating the time required to reach these locations, something that has been pushed deep into the recess of my mind surfaces. An ugly unwanted thought. A feeling of dread, reality and sadness .We are running out of time and we simply don’t have enough left to do as we please any longer. It comes as a shock after living a life so long without limits. I know it’s been coming for a long time but up until now it simply had no relevance. Now for the first time on our journey I can see the end and I’m not sure I like it. We start to plan an itinerary based on reaching Singapore in three weeks. The figures are not good and as expected we have to stop thinking about detours up wild rivers and focus on reaching our goal. It is a bitter pill to swallow, to turn your back on exotic experiences but our objective must be to reach Singapore and not to stretch ourselves too thin with the short time we have left. 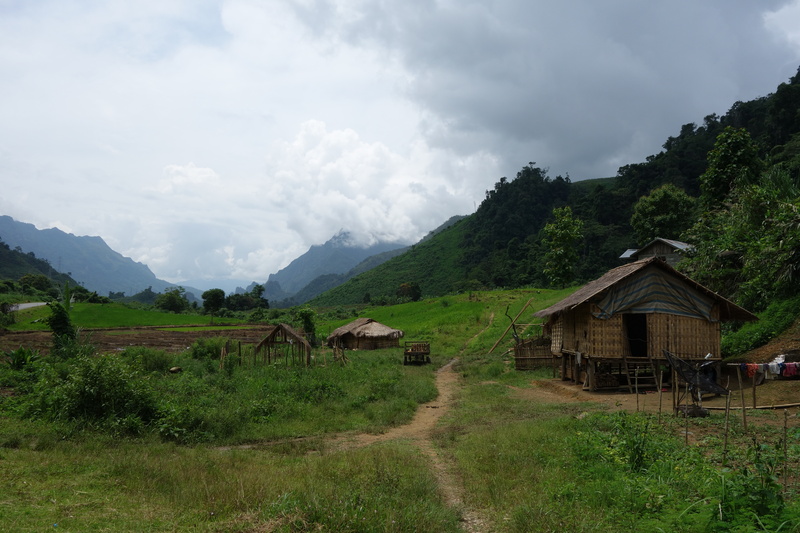 The next day we book a bus to Luang Prabang, 380km south of Luang Namtha and the cultural heart of Laos. The station is about 5km out of town. The mini buses are not permitted by the local Tuk-Tuk drivers to pick up passengers from the town centre thus ensuring monopolised employment by captive clients. I am surprised the same rule did not apply when we were dropped off last night. A large bus sits waiting for passengers when we arrive but across some broken concrete is a modern mini-van that is only 20,000 kip more than the bus. That’s about $2.50 for those slow to divide by 8000 which is perfectly understandable. I am going to miss making such calculations. The total cost per person being 110,000 kip. The journey time is supposed to be around 8 hours which I treat with suspicion. The driver is a surly man who seems disappointed by the turn out. He draws back on a cigarette and then dashes it to the ground. He hands out plastic bags to the few passengers gathered before we even set off. Not an encouraging sign for a smooth journey ahead. The locals grab at the bags with prior experience and nauseated desperation. I decline and try to keep a more positive but ignorant outlook. The driver seems determined to put the plastic bags to “good use” and sweeps around unrelenting bends. I try to keep focused on the road ahead and pretend that I am driving the vehicle. Fortunately we are seated near the front and have good vision ahead but it’s not long before we suffer our first casualty. A lady behind us starts to falter and lowers her head into a bag. The driver mercifully slows down for five minutes allowing her to recover somewhat before speeding up again. The hills around us are dripping with rain forest. The sun beats down on the green canopy sending insects into an orchestral frenzy. 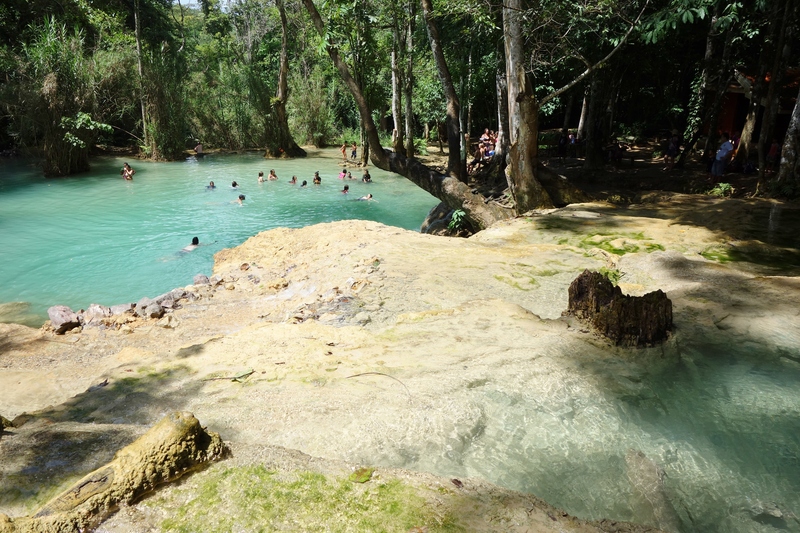 We make the journey to Luang Prabang in just over 9 hours. The driver still appears to be in foul mood and deposits our bags into a shallow pool of brown water. He closes the rear of the van and speeds off leaving us to face another Tuk-Tuk cartel, although they appear to be more Truck-Trucks in Laos. A wily driver and some friends approach us and enquire as to where we are going. Luang Prabang I answer sarcastically. His starting price is 70,000 kip a ridiculous figure as we are only 3km out of the town centre. Even the tourist price is supposed to be 20,000. We get him down to 30,000 after having to walk away for about the 500th time on our trip. It’s not annoying anymore it’s just a way of life. We are let off outside the Apsara Hotel and give him 30,000 Kip. He looks at the money and feigns confusion then offence. 30,000 each he explains and even points to both of us 30…30 as though I am grappling with mathematics. We smile at him and I give him a pat on the shoulder as if to say nice try and walk over to the Bamboo restaurant. The long day of travel has made us hungry and we order a rather excellent plate of fresh spring rolls with pork and tofu. 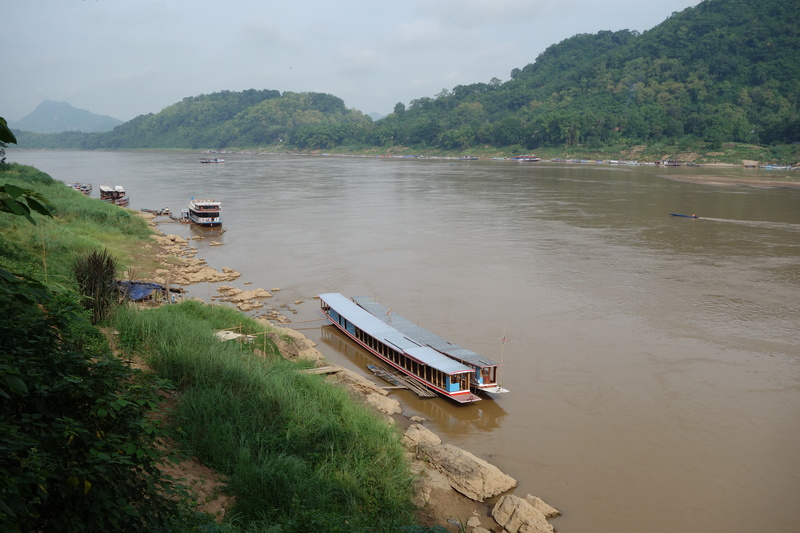 Luang Prabang is an immediately charming place of style and sophistication located on the Mekong River. Although I notice its strength and power is greatly diminished from the river we saw in Jinghong China. No doubt due to a Chinese dam further upstream I imagine. It’s still a lovely scene though, made picture-perfect by passing long tail motor boats ferrying goods. Later that night we begin what becomes a culinary love affair with the cooking at Rosella Fusion. It’s by no means a stately affair but the food is amazing and the green curry is plate licking delicious. They also make an excellent mango smoothie with yoghurt that chills your throat and freezes the brain. An excellent cure for tropical fatigue. 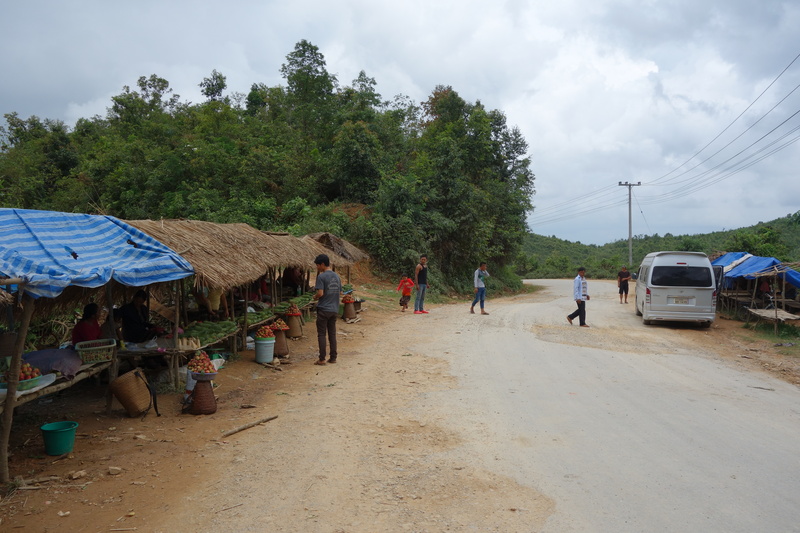 The next day we hire a truck to take us to Kuang Si about 30km south of Luang Prabang. Lining the rural roads are locals carrying umbrellas. A very useful apparatus in Laos as it’s either beating down with intense sunlight or pouring with biblical rains. Our driver waits with trust in a car park while we trek into the jungle in search of the famed blue swimming pools. In reality there is a walking path and a restaurant to guide us but it’s easy to pretend otherwise. 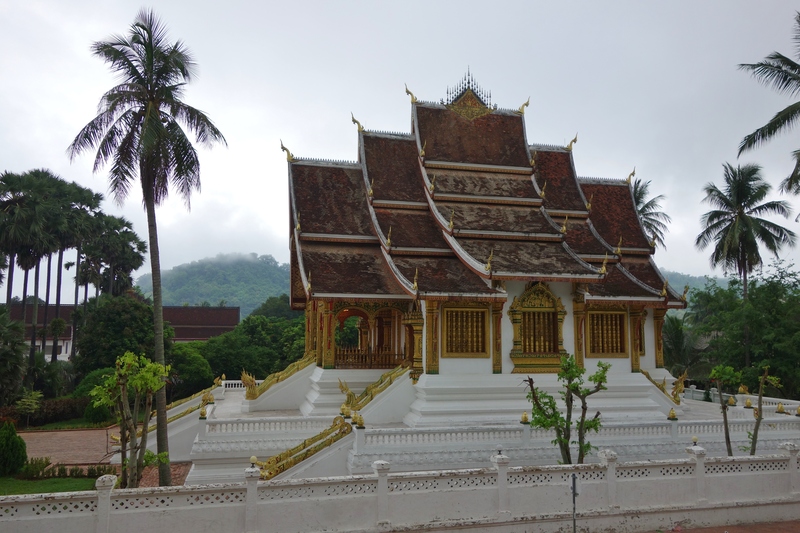 Aside from excellent restaurants and stylish hotels, Luang Prabang is an important religious centre for the people of Laos. There are many monasteries and some fine-looking temples that are beautifully decorated with colourful mosaics and topped with elaborate multi-tiered roofs that sweep almost to the ground. Although expensive to enter we are glad to at least seek refuge from an unrelenting sun. Inside is a gilded budda. His features are very different from those we saw in Tibet as is the temple is which he sits. 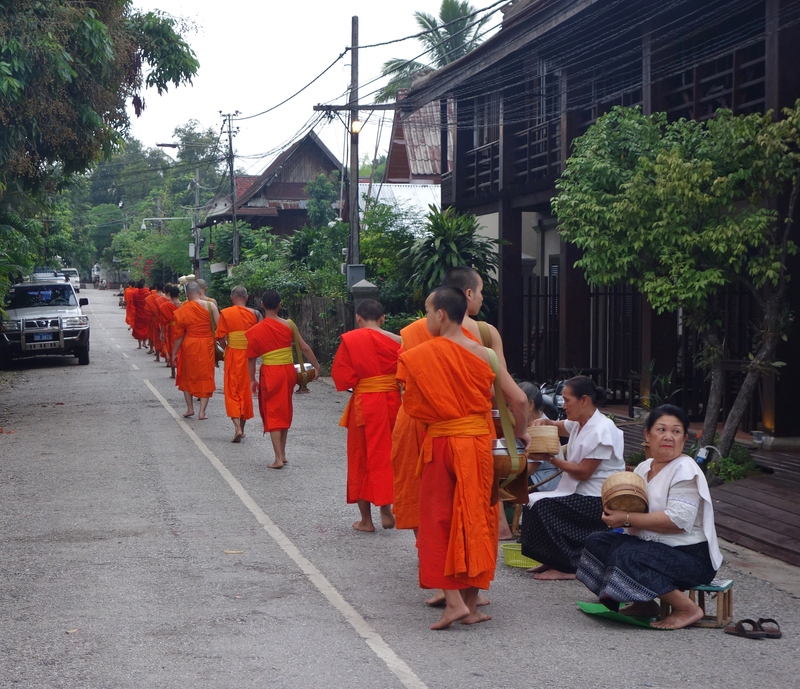 Early each morning Monks leave their monasteries in search of alms in a ceremony known as Tak Bat. Locals and an increasing number of tourists deposit sticky rice balls in the monks begging bowls. It’s a striking and contrasting scene of saffron clad monks walking along dawn grey streets. One advantage of travelling during the off season is that not many tourists are present which makes for a more authentic experience this morning. It’s a silent march and very understated and after a few minutes I return to bed happy to have witnessed just a small part of the ceremony. 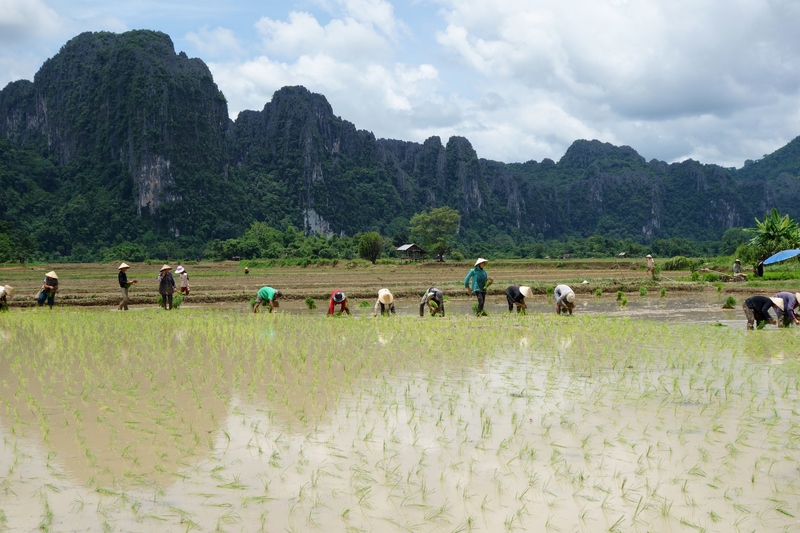 After a few more nights of green curries we sadly leave upmarket Luang Prabang behind and continue south to scruffy Vang Vieng. We have reconnected well and truly with the tourist trail. I am somewhat concerned about what we will find in Vang Vieng. Our bus is completely filled with foreign tourists and I can’t ever remember that happening anywhere on our journey. I feel oddly out of place and slightly irritated by my surroundings. 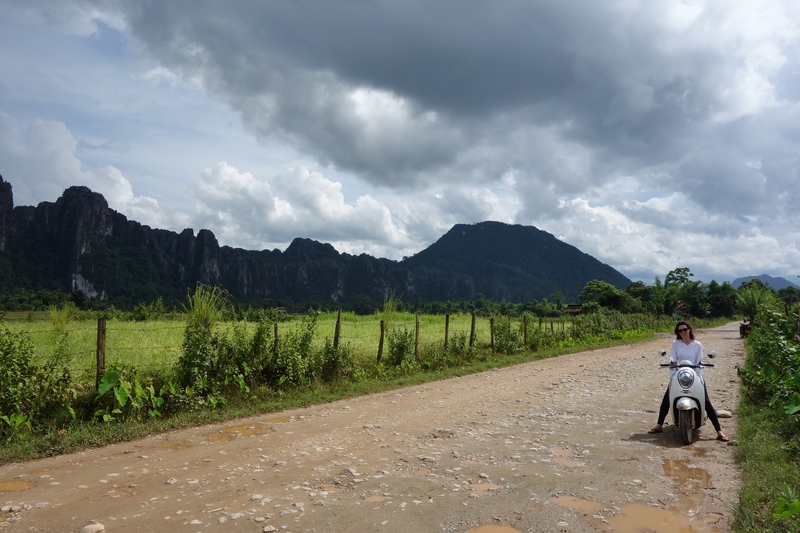 The drive to Vang Vieng is spectacular but most of the passengers have drugged themselves and seem more interested in just sleeping their way to Vang Vieng which is a terrible shame. 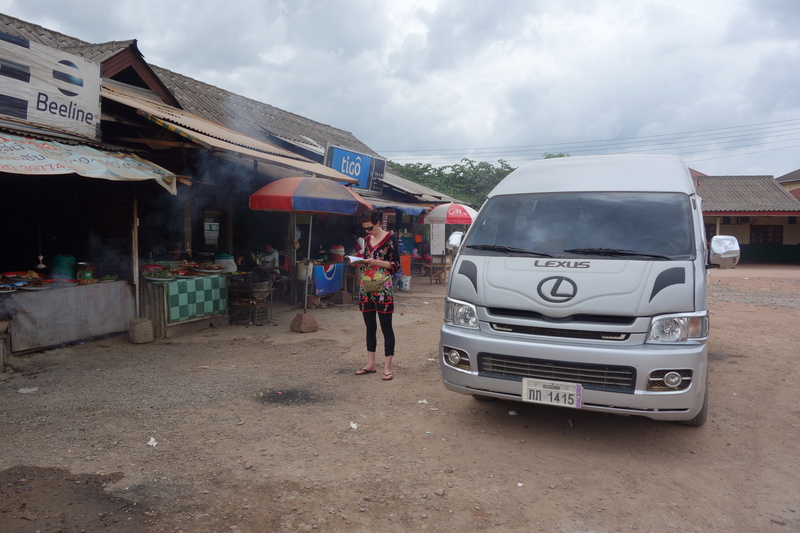 A common theme of Laos’s bus depots is there inconvenient distance from the town centres. Tuk-Tuk drivers obviously hold greater power here in Laos than their counterparts in Asia. We walk out onto the street after a fruitless debate with the local cartel. A passing driver picks us up a few hundred meters south of the depot and happily takes us into town for the correct price. I feel a resurgence of stubbornness to hold true to correct fares in our last few weeks. Soon we will have to suffer the boredom and convenience of fixed prices. The main street of Vang Vieng is crowded with all the trappings of a tourist town including Irish bars and Italian restaurants but they are poor replicas and geographically out of place. There are thankfully some Laotian restaurants among the imposters and enough of the town feels authentic enough to make for a pleasant stop. We hire a motorbike and escape the bars playing Friends into the surrounding farmlands which are spectacular and surrounded by dramatic limestone Karts. 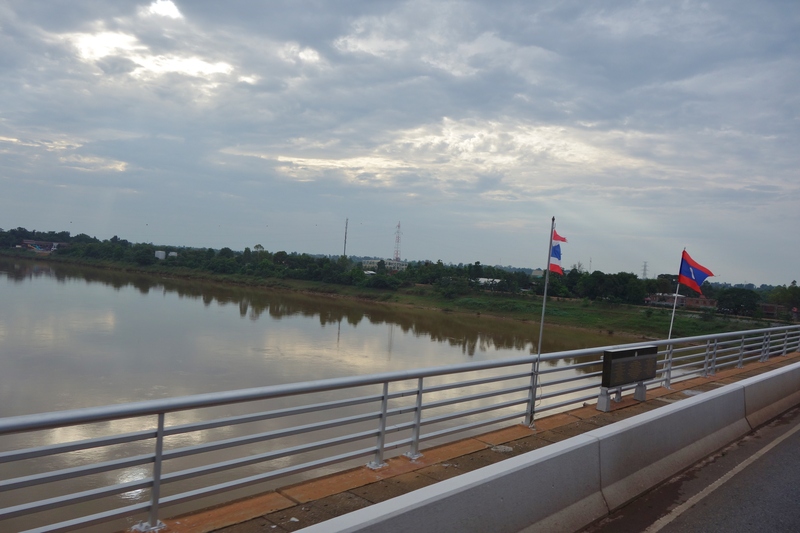 We ride a loop and pass a sign showing Vientiane the capital 175km south. I look back behind us imagining a sign that reads Cape Town 75,000 km. 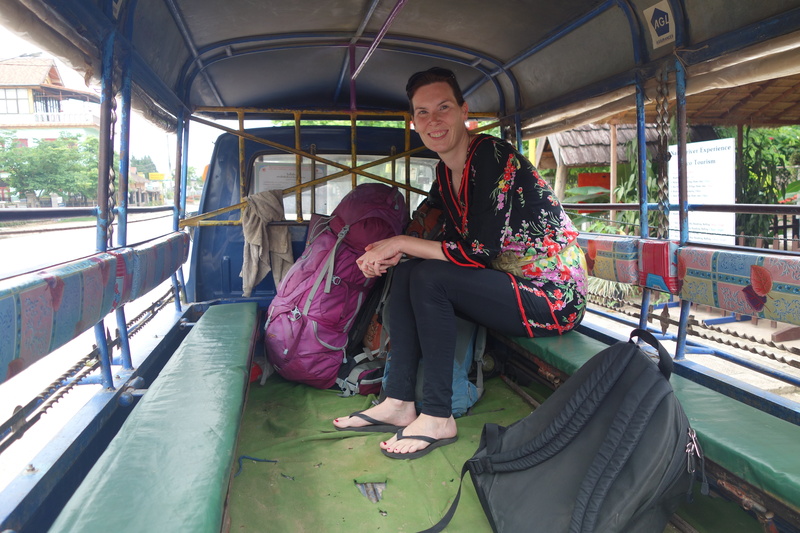 I am somewhat tempted to ride the bike all the way to Vientiane but can’t quiet work out where to store Emma and the backpacks. We avoid the travel agencies in town and go directly to the bus station hoping to find a local bus to the Capital but are taken to another station south of town where a herd of tourists sit waiting in the shade. The bus is late to arrive and even later to depart. We sit waiting for 30 minutes without moving for no apparent reason I can determine. No one else seems to have noticed as more sleeping tablets are consumed. 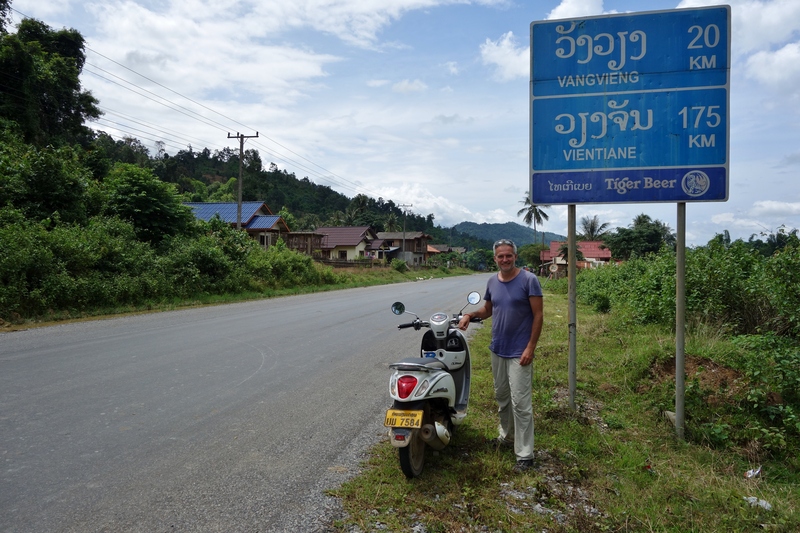 It’s a four hour journey to Vientiane and finally the beautiful roads and dramatic mountains of northern Laos give way to flatter and infinitely less appealing scenes. There is some confusion when we arrive in Vientiane as to whether we have reached the final stop. It would seem we have although the bus is continuing to Cambodia. Vientiane must be the smallest capital in Asia with a population of under a million people. Small in proportions the central part of the city rests against a disappointing stretch of the Mekong. 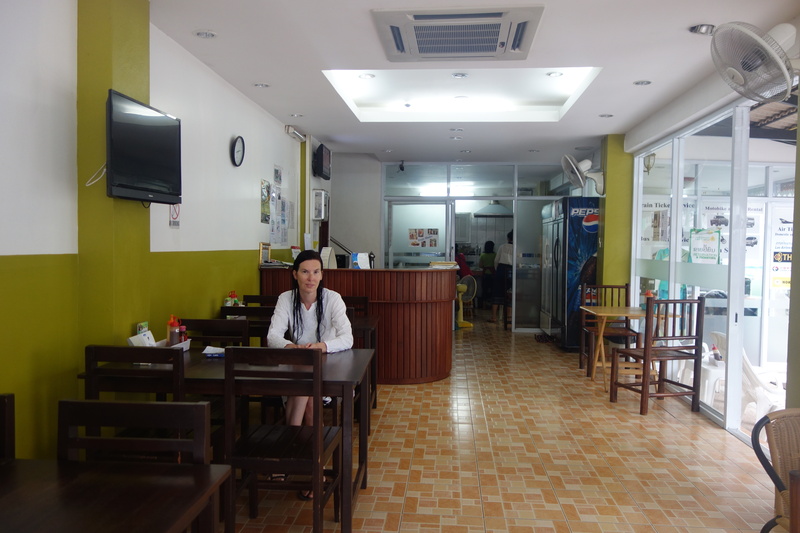 Its restaurants on the other hand are far from disappointing and offer world class standards. I am beginning to think that no one goes hungry in Laos. I go to inspect a few hotels as we shall have to stay a night; it’s too late to cross the border with Thailand. I notice many of them including some pretty cheap hostels have shoes piled up outside. No doubt to protect the travertine marble inside. I find a hotel not pretending to be a home for just 130,000 kip about $16.00 USD with ensuite bathroom and air conditioning. The young man at the front desk is a little nervous as it’s his first day at work at the Mixok Guesthouse. The next afternoon we catch a Tuk-Tuk to a small train station that sits on the edge of the city. 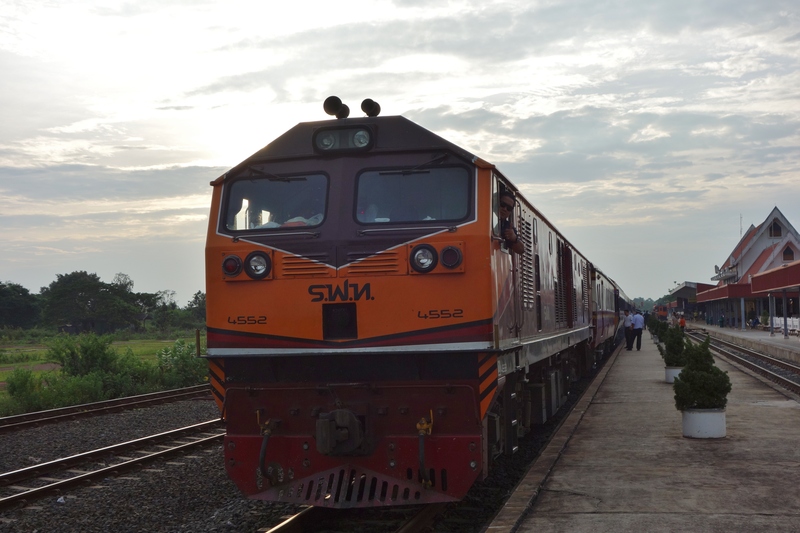 The rail network of Laos must also be one of the worlds smallest. Just a few kilometres of track that runs across a bridge that spans the Mekong River to the border of Thailand. I am feeling a little nervous as we have just read some information that indicates that Thai customs can refuse entry if you don’t have onward proof of departure. Laos’s only train station also acts as an immigration building and before boarding the two carriages we get stamped out. The small train trundles along the tracks and makes its way across the border bridge. I look across the Mekong which is at this point is very wide. Laos flags flash by then in the middle they stop and change to Thai flags. We are now geographically in Thailand. A few minutes later we stop at Nong Khai station and disembark. I walk along the platform until we reach Thai immigration. They scan my passport and I notice a photo of me on a screen taken five years ago when we started our first trip and entered from Malaysia. It feels so strange to see a picture, a moment captured in time you had forgotten. I notice how red my backpack looks. Now it is a pale and sun bleached rust colour after so many years of travel.